Conveniently hidden above one of Barnsley’s hottest restaurants, the Grill Pit, Jock’s Cavern is a speak easy where local residents come to enjoy spirits, craft beers and cocktails along with a healthy dose of live music. 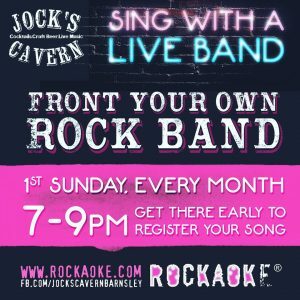 Now, on the 1st Sunday of every month, the great people of Barnsley have the chance to front their very own live rock band at Rockaoke’s latest Northern residence! 7 til 9pm. Free entry!